Chilean Nicolas Fierro was on fire on Day 1 of the World Series of Poker 6-Max Pot Limit Omaha Championship – a day which saw a field of 336 players decimated to just 36 by the close of play. Fierro has a chip stack of 131,000 after the day´s events; 50 per cent more than the player in second place – Swede Rifat Palevic – and three times more than the average. Nicolas Fierro had been on top form throughout the day, winning valuable uncontested pots from Gabriel Nassif and Johnny Chan before joining the table of then chip leader Roberto Romanello. Romanello had been the first player to crack the 100,000 chip barrier before Fierro´s arrival but, by the close of play, the chip stacks had more than flip-flopped, with the UK poker player down to a stack of just 17,800 chips. 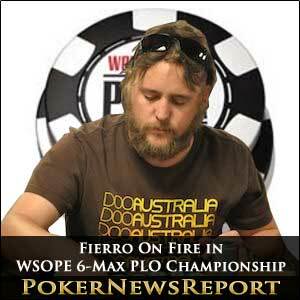 While Fierro was comfortable at the top of the leaderboard, players on other tables were fighting for their tournament lives – some making substantial leeway as the bubble approached. Jon Spinks was a major benefactor in the race to Day 2 – knocking out Guillaume Humbert (10♣ K♣ Q♣ J♥) with an unlikely pair of Jacks and Ace kicker against a flop of 6♥ 9♣ J♠. A similar stroke of good fortune was enjoyed by Rifat Palevic in the last hand of the day – finding trip Kings against Sean Lefort´s hand of Q♠ J♦ 10♦ 7♥ no matter how hard Lefort prayed for an Ace or None! Lefort´s departure left the remaining players assured of collecting a cheque at some stage in the two days that remain. 339 players paid the €1,630 buy-in and created a total prize fund of €498,330 of which the winner receives €124,584 and the first player out when play resumes today leaving the casino with €2,616. Among those who left empty-handed yesterday were November Niners Phil Collins, Eoghan O´Dea, Matt Giannetti and Ben Lamb (makes you wonder what they talk about in the bar afterwards), while Phil Hellmuth made no headway into the WSOP Player of the Year title – arriving late and departing early!